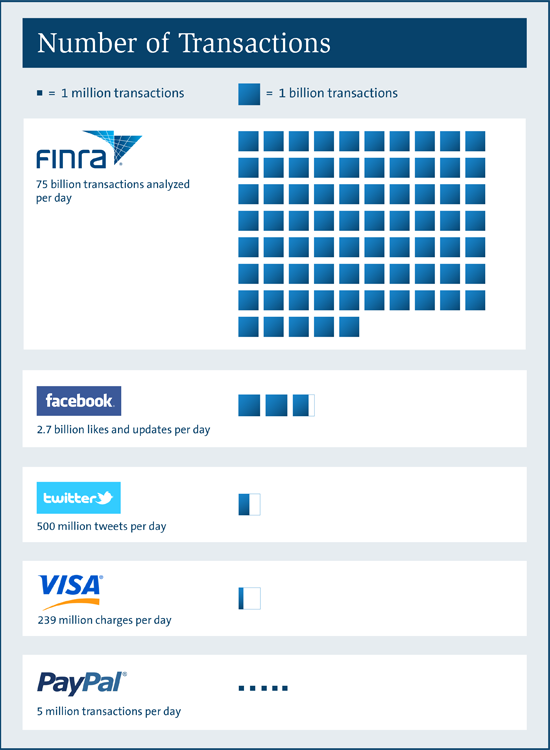 Every day, FINRA oversees up to 100 billion market transactions, using technology powerful enough to detect potential abuses. Applying a variety of data-gathering techniques, we work to uncover insider trading and any strategies firms or individuals use to gain an unfair advantage. We invest in innovative technology—like cloud computing—in order to build sophisticated surveillance systems, process extraordinary amounts of data, and work with cutting-edge applications, programs and hardware. 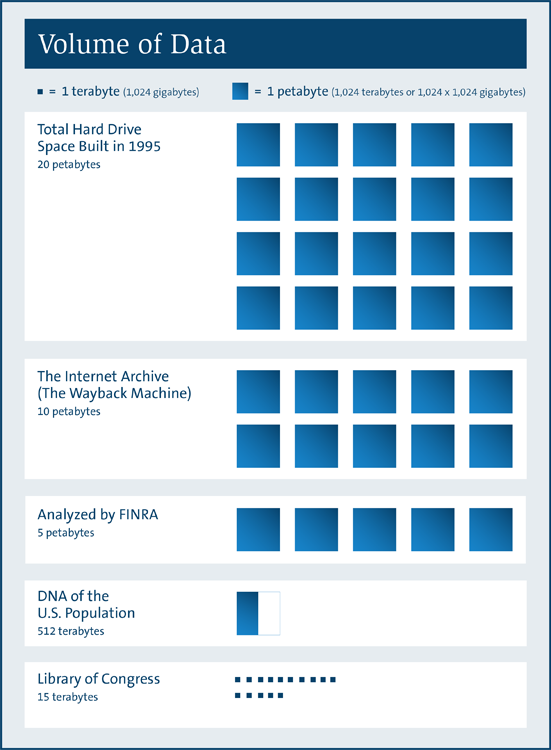 FINRA uses cloud computing and leverages data technology to process our ever-increasing volume of data. This unique picture allows FINRA to protect investors from abuse and manipulation by wrong-doers. 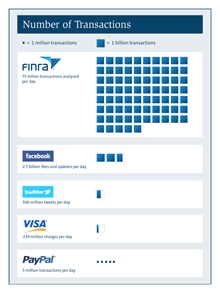 FINRA processes on average 50 billion—and up to 100 billion—transactions every day. That's more than Twitter, Visa®, PayPal and Facebook combined. We use innovative technology, such as parallel computing hardware, to process our ever-increasing data volume and cloud computing to automate the process and store the massive amounts of data. The combination of cloud computing and big data software allows us to shift our computing power between FINRA’s applications so that we can quickly respond to changing regulatory demands in a cost-effective way. FINRA uses its technology to monitor trading in the stock and bond markets. We run hundreds of surveillance algorithms and patterns against massive amounts of trade data to detect market manipulation, insider trading and compliance breaches. We operate several information systems that range from large, structured databases to unstructured content repositories. We combine search engine and analytics technology to make sure all of the data we collect from firms and exchanges is accessible with one search or surveillance query. We spent the last few years modernizing the technology of our examination platform. We've transformed the approach and procedures we use to conduct a more risk-based approach to oversight exams of firms. The redesigned system allows FINRA staff to analyze a wide range of data and gives firms tools to submit information to us electronically. This approach allows FINRA to efficiently and effectively monitor and examine more than 4,100 securities firms and over 635,000 brokers. Central Registration Depository (Web CRD) – FINRA operates the central licensing and registration system for the U.S. securities industry and its regulators. It is a framework of uniform registration forms, one-stop form filing and fee collection, and a single regulatory database and registration processing system to meet the requirements of all participating securities regulators. BrokerCheck – FINRA derives information from the CRD and IAPD to provide a free tool to investors called BrokerCheck. With BrokerCheck, investors can research the professional backgrounds of current and former FINRA-registered brokerage firms and brokers, as well as investment adviser firms and representatives. Investment Adviser Registration Depository (IARD) and Investment Adviser Public Disclosure (IAPD) – FINRA developed and operates these systems under contract agreements with the SEC and state regulators. These systems provide a secure, Web-based, electronic filing, registration and regulation system for investment adviser firms and their registered individuals. DataGenerator – A testing tool that allows the user to model the behavior of a piece of software by employing specification and dependency modeling. Using templates, it enables the user to produce highly customizable and dynamically calculated test expectations, test data or test scripts to help verify software. Extensions for WebDriver – An enhancement to the powerful WebDriver API, with robust features that keep your browser automation running smoothly. It provides a widget library, improved session management and extended functions over the existing WebDriver API. Mock Service Layer (MSL) – A set of tools that enable developers to deploy UI code on Node and mock the service layer for fast, targeted testing. Visit FINRA’s open source project page.